On the other hand, employee disengagement costs the USA alone over $500 billion annually. Engaged, motivated workers have higher employee satisfaction, which leads to enthusiasm in their role and overall company growth in the form of higher retention and lower turnover; higher productivity; increased profitability; less absenteeism, and increased employee loyalty. 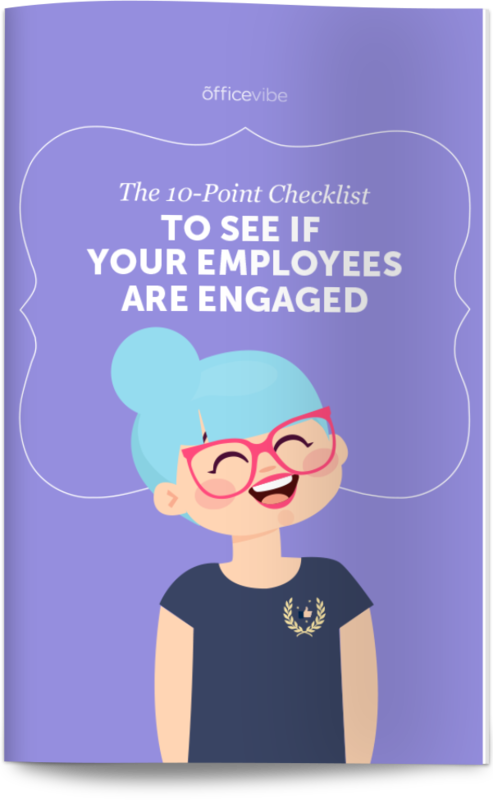 In this post, we will look at the benefits of employee engagement, how to measure it, and then how you can start engaging your employees right way. Employee satisfaction is key in any company, and when employees are not satisfied with their job, they lack enthusiasm about the day to day of their role and the growth of their companies at large. Low job satisfaction becomes a drain on the company’s time and money. When employees are engaged at work and feel satisfied with their position, they feel a greater connection to the company and are therefore more likely to produce quality work, which benefits the company as well as the customer. Another benefit of investing in employee engagement is that it will help you retain your top employees and decrease your turnover rates by ensuring that your team is happy. Engaged employees work faster, harder and stronger because they like what they do. It’s a no-brainer; when you’re interested in and connected to what you’re doing, you are more likely to do it well. Furthermore, when employees are engaged and feel that they are treated well by their managers, they will feel a sense of responsibility to reciprocate this respect by putting in their best effort. Of course, when your employees feel good at work, they work harder, and when they work harder they produce more quality work which in the end points to a happy customer. Happy customers keep coming back and they refer other people to your company. It’s such a simple way to increase your company’s profitability but so many organizations keep looking outward instead of turning inward. Without a solid foundation, no company can thrive and the best way to ensure this sturdy base is to have an engaged team. The issue with disengaged employees is that they don’t feel a sense of responsibility to the company they work for, so they don’t have a problem not showing up. Engaged employees feel that they are part of the organization they work for, and therefore would not want to let them down. A huge benefit of having engaged employees is that they are loyal to your company and therefore act as company ambassadors. In order to find out whether or not your employees feel loyal to your brand, you can use the Employee Net Promoter Score (eNPS). Originally, this scale was used to measure customer loyalty, but it became apparent that understanding how employees feel about their company would affect how customers feel about it too. Pulse surveys are a great way to measure employee engagement and see how your team is feeling at all times. The more knowledge you have about your team, the more you’ll be able to solve problems work towards employee engagement. Short – Pulse surveys should be no longer than 5-10 questions in order to keep employees engaged in the process and so as to not collect too much data. Frequent – Pulse surveys can be sent out once a week so that you can see how your team is feeling at all times. Because they are short and sweet (the process can be just under a minute), employees won’t mind answering, in fact it might even become something they look forward to. Specific – Keep the survey focused on specific areas that need improvement. Don’t try to collect too much at once. Simple – Keep your questions clean and concise so that the answers are clear and definitive, which will make acting on them more realistic. Anonymous– Make sure that you allow employees to respond to these surveys anonymously so that you can collect the most honest answers, and therefore provide them with the most relevant solutions. Actionable– Employees need to see that they are sharing their thoughts with their managers for a reason. When employees see that you put action put to intention, as a conditioned response they will continue to share with you, knowing that they are being heard. The first way to keep your employees is to onboard them properly. Employees who go through a structured onboarding are 58% more likely to be with the organization after three years, but sadly, 22% of companies currently do not have a formal onboarding process. One of the most important ways to engage your employees is to constantly communicate with them. They want to improve, so offering them frequent feedback on their work, and that includes constructive criticism, is greatly appreciated and will keep them working towards the achievement of their goals. Offering solely annual performance reviews is problematic. They don’t allow for constant progression, and it will only instill fear in your employees, which ultimately disengages them. Monthly one-on-ones and frequent check-ins are the best way to keep employees interested, motivated and engaged. It’s extremely important to build a culture of employee recognition and offer praise to your team. When employees feel valued, recognized and appreciated for their hard work, they want to continue to do a good job for their company. To keep your employees engaged, they need to feel as though there is room for them to grow personally and professionally within the organization. Investing time and money in their personal growth lets them know that you see them as a valuable, long-term members of the team. Results from the Harvard Business Review’s 2013 employee engagement survey reveal that 70% of people surveyed say that they are most engaged when senior leadership continually updates and communicates company strategy. Why? Because they feel part of the bigger picture, working towards a collective end goal. They will feel grateful for being kept in the loop, important to the team, and aligned with the company vision. Offering your employees fun and helpful perks and benefits lets them know that you appreciate their efforts and hard work. It also makes work a more enjoyable place to come to, which will help keep your team engaged. Gym membership – Let them know that you care about their health. Healthy lunches – Have healthy food brought to the office to help your employees feel good and stay focused. Remote work – Offer the option for remote work to let your employees know that you trust them. Transportation – Help employees pay for their transportation to and from work. Do you have any more questions about the benefits of employee engagement? Ask us in the comments below – we’d be happy to answer!